This lesson introduces the capabilities and benefits of rapid scan imaging from geostationary meteorological satellites with a special focus on the current Meteosat Second Generation satellites. 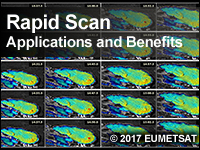 The lesson begins with an overview of current rapid scan imaging strategies and the products made from those observations. It then addresses nowcasting applications that benefit from these products with a focus on convection and its evolution. Other application areas that benefit from rapid scan observation are mentioned including the monitoring of fog and low stratus, wildfires, tropical cyclones, and atmospheric motion vector data. The final section describes the new and next-generation rapid scan datasets from international satellite operators around the world and improvements for advancing weather analysis and prediction. A lot of this information was new to me. Although I learned a fair amount, it was sometimes difficult to understand. This is all new to me so I really need a more detailed lesson. Good lesson to appreciate the value of Rapid Scan technology. I had no previous experience with Rapid Scan Weather Applications. This course was very informative on the subject matter and I now have a further understanding of the information contained herein. Very good course. I have limited knowledge of this subject but this course gave a a better perspective and look forward to more courses. Good lesson which I recommend to every weather forecaster.Very beneficial. Hello everybody. I'm very interested to work in this field and have a company specialized in Rapid Scaning Imagery Services.What materials (software and computer) and knowledges do I need ? Thanks for your help. I enjoyed learning about the newer technological advances that are going to help in forecasting weather. Very good for the front desk forecasters..
rather confusing for a novice. It is challenging to read these pictures accurately. Great module with use of examples from European severe storms and Colorado as well. two word errors are in here. I also really really like this class and enjoyed it so thanks. I have also brought up to you guys a problem in which is in this course as well and that's the "back up to top" hyperlink when you go to the bottom of the page it "covers up" most of the "next" link on the bottom of the page and this course does that as well.